Thinking brand, what are the things that can come into one’s mind? In all probability trust, sustainability, sale, timelessness or even price! A great platform to exhibit and create relationships with the consumer, the internet has revolutionized how brands interact today. While the internet has crept into our lives for the better, it is something that has become a part of even a child’s life today. In this age of constant interaction and engagement, while families may seem so split apart, before interacting with any child, brands would still need to re-think every strategy when it comes to interacting with a child. Growing beyond flash and banner ads, the ‘in’ word for brands on the internet is brand engagement. Possibly simple sounding, but, a great amount of thought, research and strategy goes behind every interaction that child has on the online space. A common error made by many is that when they think children, they think of ‘dumbing down’ the content. Today with kids being bombarded with so much information from multiple mediums, it is already a great challenge to hold their attention span, let alone understand your product on offer! Whereas, the switch from smart phone to laptop in their little hands has become so much easier, so has the change from content! Children want to be treated as equals, more so when they see their peers engaging in content that is so much more different from theirs. This sense of aspiration must be treated with attention and urgency by brands in order to tap the ever growing number of children online. Furthermore, some brands that have worked amazingly with kids, have been those that have been able to sustain as part of a child’s daily environment. For example, Green Gold’s adorable Chhota Bheem fits in perfectly to Grandma’s stories as well as the child’s perception of laddoos to gain strength. A parent in this case would not necessarily worry so much as the child learns more about the rich Indian culture as well as avoiding junk food for laddoos. Last heard, the popular television series has also helped the local mithaiwala increase his laddoo sales beyond the festive season. Another aspect that brands should keep in mind is that they need to personalize content as per the age group of the children that they are targeting. Brands often tend to offer what may be considered as a safe bet across different age groups. For example, it is taken for granted that all kids love games, but this is also because there is nothing else for a child to do! In addition, the kind of games that kids play today, have no age sensitivity. We see kids at an early age playing games that are about chasing a thief, killing a villain etc. I think not only brands but even websites should have the sensitivity towards this. In the process of storytelling, many a times we tend to make our brand the hero. While this may certainly have it’s short term benefits, customers today want to be seen as the hero and the brand the process towards which the consumer can aspire to be the hero. In addition, becoming a mentor would help serve the brand’s purpose of becoming a part of their consumer’s story. Each child aspires to become something in life, a NASCAR driver, a doctor, engineer or even an astronaut! In doing so they would definitely look up to those avenues that help them achieve their target (whether temporary or permanent). This is where the concept of ‘in-platform’ engagement can help children be a part of the story. For instance, worldoo.com offered kids the opportunity to select and decorate their virtual homes with special glow-in-the dark theme from Asian Paints. This not only made for a fun experience for kids, but also allowed the brand to gain valuable knowledge on what kids really think of their products. Every child loves the exclusive attention received from the parent. Similarly among all the clutter in the online world, allowing children to take part in the process of creating conversation will go a long way in creating fondness as well as recall for the brand. Brands in the children’s space have a great opportunity to go beyond advertising and conventional reach. They can build a community of kids on the internet if they stop playing the CPM or CLICK game with their Digital Agencies. If brands invest in using the digital medium as a serious tool to build a kids community, they can innovate an all new CRM medium to tap them. Why not aspire to be the brand that looks into engaging with existing platforms and co-create content? Maybe even use the offline activations budgets into the digital medium to engage with their audience. A mall activity would easily cost a brand around 5 lakh to reach out to 200 kids, however, if a brand ties up with existing platforms and co-creates content, they can reach out and engage with a large number of kids at 1/10th the cost of mall activation further winning the hearts of parents if they produce responsible content. Dealing with children is in essence a two part process. One deals directly with the child as an audience and the other with the parent. No parent appreciates a direct sell to their child, in addition, they already have many concerns about their parents growing up too fast for their age and becoming too materialistic. A recent example of locking horns with parents can be seen in the U.S. where The Federal Trade Commission filed a lawsuit against Amazon.com stating that they charged parents in-tune of over a million dollar for un-authorized in-app purchases. According to the Advertising Association of U.K., children can recognize advertising at an early age itself but can only make judgments about it when they reach middle childhood. While parents have a measure of concern about the impact of advertising and marketing to their child, other issues that affect their own lives and that of their children take higher priority. In such a scenario, a responsible brand will ensure not to add onto to the plate of growing concerns for parents. All in all, there are no shortcuts to a child’s safety online. Making your audience comfortable is a foremost priority while looking cool for the kid and gaining acceptance of the parent. 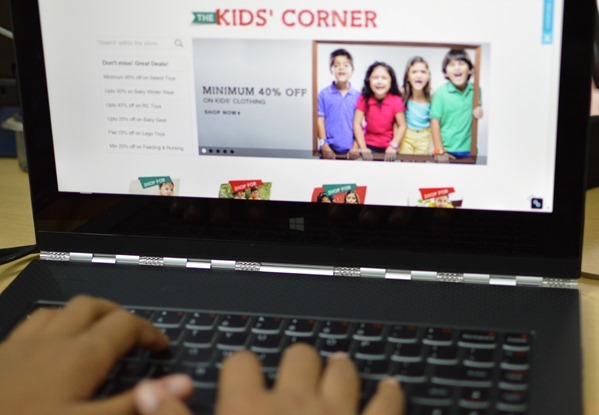 With 134 million kids expected online in India alone by 2017 (according to The Boston Consulting Group), there is a huge potential for ecommerce companies aiming to tap a younger audience. While staying ahead of the competition is the name of the game, it is also time to taking into account the responsibility of moulding young minds. The right influence nevertheless will go a long way in creating loyal brand enthusiasts of the future.